"Carolina Waterway Plantation residents find an array of fine eateries and exciting entertainment. The visual art scene is an eye-opening experience, with music, dance, comedy and drama performed at Broadway at the Beach - a 350-acre complex that features live theater, a nightclub district, restaurants and specialty shops." When it comes to deciding where to lay their heads (and wings), many seafaring birds, including the brown pelican, migrate to the most pristine environment. According to the Audubon Society, these birds serve as a beacon - moving to the beach that is the best. Our fair-weather and full-feathered friends have flocked to the Intracoastal Waterway and reside on almost every post and perch available in Carolina Waterway Plantation. This development is not just for the birds, though. The first of four Myrtle Beach communities, Carolina Waterway Plantation offers exceptional values. Typically 60 feet by 225 feet, waterfront property in this community rewards sea lovers with an excellent ocean view and access to the Waterway by means of a community boat ramp. Every two waterfront homeowners may someday share a two-slip boat dock. Land lovers also will soak up the good life with other amenities offered at Carolina Waterway Plantation. "Fun is year-round here," said Jade Thomas, owner of Realty Executives. "There are beautiful pool facilities, lighted tennis courts, a waterfront viewing park and playground areas." Distinctive in design, Carolina Waterway Plantation features a variety of architectural details. Smaller lots take on the hugely popular beach style, while the more expansive lots draw from a more present-day yet open traditional floor plan. 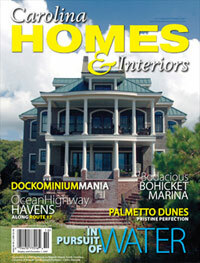 "We do old-style, traditional and Mediterranean," J.R. Abernathy of Dynamic Construction explained. "To tell you the truth, we enjoy doing a little bit of everything. It's like the old saying, 'Variety is the spice of life.'" To ensure all the elements of the community fit together and the neighborhoods are aesthetically pleasing, all construction must be approved by the Architectural Review Board. Stemming from this careful attention to detail, the wellmanicured and well-planned landscape blooms as you enter into the security entrance and thrives throughout the development. Nearby, Carolina Waterway Plantation residents find an array of fine eateries and exciting entertainment. The visual art scene is an eye-opening experience, with music, dance, comedy and drama performed at Broadway at the Beach - a 350-acre complex that features live theater, a nightclub district, restaurants and specialty shops. Myrtle Beach is also known for its incredible golf. According to the Myrtle Beach Area Convention and Visitors Bureau, the "seaside golf capital of the world" has a new moniker: Sportstown. In 2004, Sports Illustrated and the National Recreation and Park Association selected one city in each state to bear this name, rooting on Myrtle Beach because "Its leaders recognize that sports are an enormous force for good in the community." Here, the golf season is in full swing yearround, with bent-grass greens and challenging layouts that are the rule rather than the exception. Within three minutes of Carolina Waterway Plantation, the International World Tour and River Oaks Golf Courses are only a shot away. "Everyone's a winner here," Thomas laughed. "Even though you're at home, it always feels like you are on vacation." Property owners thinking about the future can opt to buy now and build later, paying today's prices for tomorrow's retirement plan. As gorgeous waterfront property such as the Carolina Waterway Plantation takes flight, this is truly a case of the early bird getting the worm.